Relationships: What Really Matters Most! Relationships matter! As a coach to individuals, couples, families and businesses, I am, on a daily basis, assisting people to create solutions for their most challenging relationships. I took time out this weekend, or so I thought, from coaching, to go to my 40 year reunion of my elementary school in New York City. Most people who attend school reunions typically go to their high school or college reunion. This was different. It was a gathering of my peers, on-site, at the school itself, who journeyed with me from kindergarten to 8th grade: many of whom I have not seen in 40 years! Talk about re-living your childhood! It was wonderful to see the faces from my past, although they have matured and changed just a bit from 14 to 54. I am blessed to say, I am still friends with many of them to this day. With others, it was an amazing trip back in time to a place of true innocence and a time when we all developed our beliefs about ourselves and our world. Ponder this idea: every decision you and I make today is likely rooted in some belief, either positive or negative, from our childhood and adolescence. When you attend a reunion, you get a really clear idea of the beliefs, be they positive or negative, that have dominated your thinking for so long and still do. So, here I am attending this gathering of former classmates. Many, I felt, would seem like complete strangers to me. They are leading different lives than I am. They probably have different life-styles, different viewpoints on a variety of subject-matter from politics, religion, to who’s your favorite professional sports team. Would we have anything to talk about after 40 years? Was that really going to matter? In addition, would I have anything to say that sounded halfway intelligent to my classmates after 40 years? Did that really matter? Would anyone really care? In short, the answer to both questions is ‘No!’ Conversations were mostly reminiscent in content. There was so much excitement as we wandered the hallways recalling highlights of a distant past. As we perhaps sugar-coated, embellished and exaggerated events, the content of conversation became irrelevant. Who we are now and what we do now seemed to be inconsequential. What became extremely apparent was that there were no words necessary or possible to describe the bonds we all shared as children and classmates all those years ago. The realization for me was that after 40 years, each and every one of us still had relationships with everyone else who was present. For those classmates I hadn’t seen all those years, I was still participating in a relationship with each and every one of them. They may have been out-of-sight and out-of-mind for all of those years, yet the memories and their effects, both positive and negative, still endured. My friend Eleanor, who I have been friends with since 6 years of age, put it so eloquently when she said to me: ‘These relationships are for this entire lifetime because the roots are old, deep and forever intertwined.’ She was so on-the-mark with her comment. We all shared so many experiences that endure today, 40 years later, in our hearts and minds. I learned on this day, as I have on so many countless occasions, that relationships never die…they just change. Those relationships we hold close to our hearts or rehash in our minds are extremely powerful in that they have the ability to move us in the direction of our wildest dreams or our worst nightmares. How we perceive our relationships, both past and present, directly influences every decision you and I make. Relationships are like a train depot. Growing up in New York City I spent many hours on its’ infamous subway system. I recall taking the subway to the ‘end of the line’ where all of the trains converged, merged and diverged all in one location. Some coming in, others going out. A few passing on the right, and others moving to left. In, out, constantly changing, moving from one train track to another. That’s what our relationships are like. They are always on the move, changing, evolving, going in one direction or another. Relationships, much to our dismay, are also temporary. Sometimes temporary can last a lifetime, yet it’s still temporary. There is also an inherent fear that we have inadvertently built in to all of our relationships. This fear is the belief that all of our relationships, at some point in time, are going to end. Consider this: your and my relationships never end and they never die. Yes, we all eventually will physically come to an end and leave our bodies. Yet, even then, we still have relationships with those who have passed on to wherever it is they pass on to. And yes, we may not see certain people in our lives for many decades, like I experienced this past week; however, those relationships live on. The important question to ask yourself is: ‘Where do you store your relationships?’ Are they in your mind conjuring up negativity, judgments, grudges, guilt and regrets? Or do they live in your heart, where you realize that every relationship you and I have is a reflection of our participation in the process of life. I know, beyond any doubt, that our relationships mirror the direction we are moving, the choices we make, and the quality and quantity of the love we share with others and ourselves. You and I have one relationship with many people. It is never too late to hone your relationship skills. Start at home with the relationship you have with yourself. Recall that train depot I described a moment ago. Picture it again. It is also a great image of the internal relationship we have with ourselves. Each train is a different aspect of who we are. Begin to have a relationship with all of those trains. Do not be frightened! Remember, all of our relationships, even the one you are having with yourself, are temporary and changeable in any given moment! 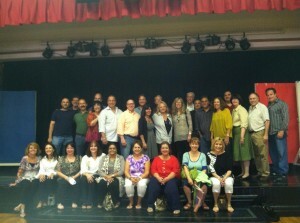 My 40th elementary school reunion put a huge smile on my face. Full of memories from a childhood gone by decades ago. Yet, the relationships live on. Changed only by the temporary, ever-changing aspect that life is, these relationships can, if we want them to, have a place in our hearts forever! Now there’s nothing temporary about that!